The unique properties of radio frequency (RF) electromagnetic radiation enabled countless innovations in recent decades, including the development of radar systems. Depending on the frequency, RF radiation can travel through solid insulating structures, typical atmospheric conditions, clouds, and rain with only minimal losses allowing for its use over long ranges and in varied weather conditions. The aerospace and defense industries have expanded and progressed rapidly as a result of using radar systems for detection and classification tasks to determine if an object or target is present, where it is located, and if it is moving or stationary. The prevalent use of radar in the defense industry has naturally created the need for detection avoidance methods in order to maintain a competitive edge. This has led to the design of many technologically fascinating stealth airplanes and ships. Radar systems require antennas to transmit and receive RF radiation as a means to gain information about a target. The transmitting antenna converts electrical power into RF waves that are typically emitted in a predetermined direction. 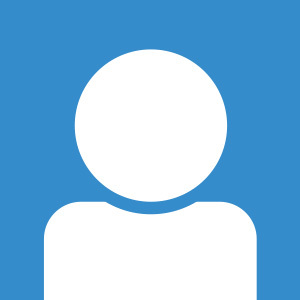 If a target is present, particularly one consisting of electrically conducting materials, the RF waves are scattered and some are reflected back toward the source. Radar systems are often designed with the transmitter and receiver at the same location. Therefore, RF waves reaching the source are detected by the receiving antenna and converted into electrical signals for further processing and data extraction. A particular challenge is creating a stealth antenna design that allows stealth aircraft to evade detection by radar while still permitting radio communication, which is achieved through the innovative work performed by the simulation team at the Altran Group. Their work is featured in the article “Picking the Pattern for a Stealth Antenna” on page 34 in the 2013 edition of COMSOL News. 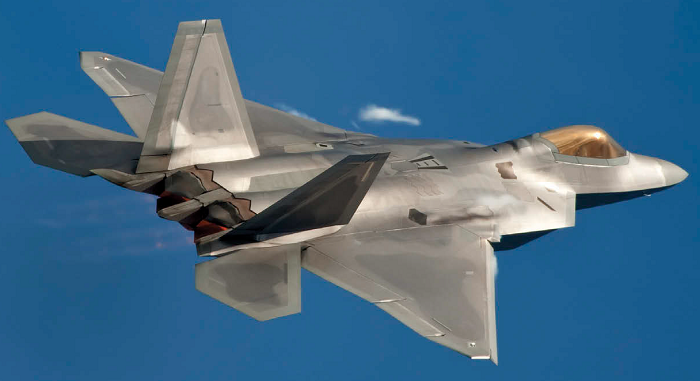 The objective in designing stealth aircraft is to minimize their radar cross section (RCS), a metric that quantifies the ability of an object to scatter or reflect RF radiation. The RCS depends on many variables, including the polarization and frequency of the incident wave, in addition to target properties such as material, absolute size, and relative size compared with the RF wavelength. The best way to avoid detection by a radar system is to make sure it never receives a reflected RF signal. The surface of a stealth aircraft is designed to either absorb RF radiation or to reflect it so that it cannot reach the source. The antennas in an aircraft, however, cannot be concealed using these particular surface technologies since that would prevent their use for communication purposes. Instead, Altran Group is investigating frequency selective surfaces (FSS) that will enable the antennas to perform normally at radio frequencies for communications, while absorbing all other RF frequencies. An FSS is essentially a bandpass filter that can dramatically reduce the RCS to create a stealth antenna. 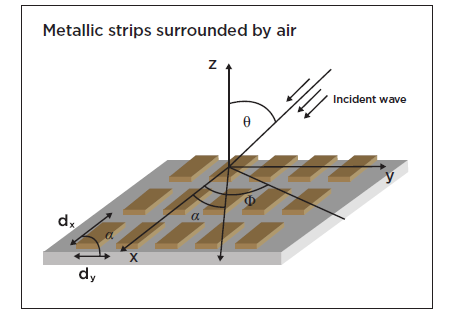 Frequency selective surfaces incorporate periodic metallic patterns, as shown in the following figure, to achieve the requisite RF filtering behavior for an operational stealth antenna design. Example of a frequency selective surface (FSS) comprised of periodically arranged metallic strips. The performance of an FSS can vary depending on the metal thickness, shape, phasing between elements, and selection of substrate material. Physically constructing and testing the possible combinations would be too inefficient and impractical. 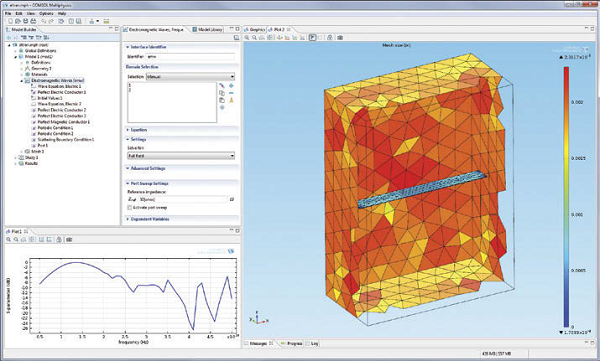 Hence, Altran Group has used COMSOL to investigate the frequency response for a wide range of design parameters including more complex designs that can operate at multiple resonant frequencies. The following figure features a model of a simple FSS evaluated using COMSOL Multiphysics. The figure shows the meshed geometry along with the corresponding frequency response curve. An actual FSS would be electrically very large and require excessive computational power and time. The model presented in the figure above represents a single unit cell of an FSS. The simulation however, still accurately reflects the performance of a full-size FSS due to the clever use of the Periodic boundary condition (PBC) feature in COMSOL. The electromagnetic fields are continuous when using the PBC, producing results that are equivalent to simulating an entire array of structures. The researchers estimate that using the PBC feature provides up to a 1,000-fold improvement in simulation efficiency and should prove useful as they continue to investigate FSS designs. In further studies, they plan to work with optimization algorithms and add a supporting dielectric substrate to their FSS model.